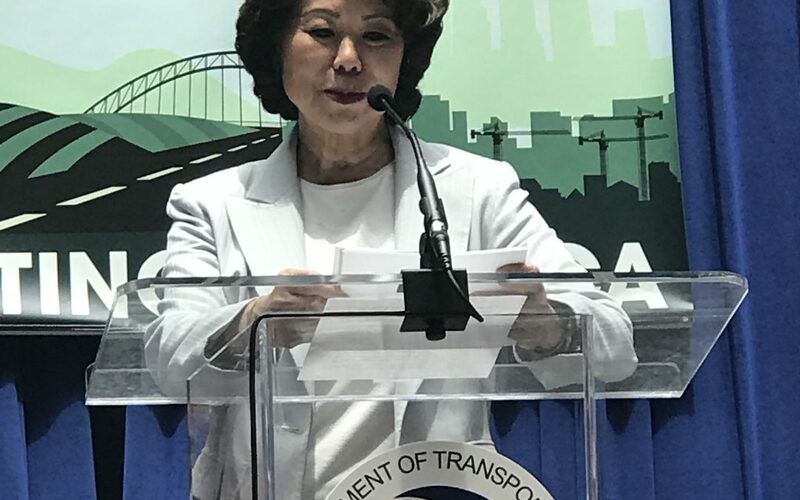 U.S. Transportation Secretary Elaine Chao June 8 announced the award of $1.5 billion in federal grants to support 26 highway and freight improvement project in 23 states. The Georgia Department of Transportation will receive the largest grant—$184 million for an express lanes project. The smallest award is $6 million to the University of Alabama to construct a bridge over an existing rail line. The House Transportation & Infrastructure Committee released the list of recipients June 5. The funds to support these grants were authorized by the 2015 FAST Act surface transportation reauthorization law under a newly created “Nationally Significant Freight and Highway Projects Program” that would provide on average $900 million a year to support projects with a minimum total cost of $100 million (10 percent of the available resources are reserved for small projects with a minimum cost of $5 million). As a part of this restructuring, the administration chose to delay release of the FY 2017 large project grants to combine theme with all of FY 2018 awards. According to the U.S. Department of Transportation, the $1.5 billion in FY 2017 and 2018 INFRA Grants will support projects with a total cost of $7.66 billion. As such, the federal contribution would be 20 percent. By comparison, there were a total of $759 million in FY 2016 FASTLANE Grants under the Obama administration which supported $3.6 billion in total project costs for federal share of 21 percent. Where the Obama and Trump administrations differ on implementing this program, however, is the portion of grants made to non-highway related freight projects. The FAST Act allows up to a total of $500 million of the program’s five-year resources to be used on rail, port and water projects as long as they benefit freight movement. The Obama administration designated $173 million (23 percent) of the FY 2016 funding for such projects. By comparison, the Trump administration designated roughly $75 million (five percent) of the $1.5 billion for non-highway projects. The INFRA Grants program is authorized to receive $950 million in FY 2019 and the House and Senate are advancing FY 2019 transportation appropriations bills that would fully fund the FAST Act.